Great rates, terrific location, convenience and comfort are highlights of this spacious and recently redecorated condominium resort. Enjoy stunning, panoramic views of Waikiki and Honolulu from the fabulous rooftop recreation deck. 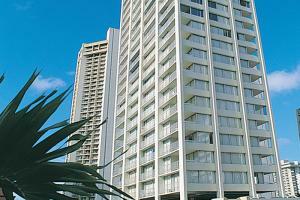 Located about a block from Waikiki Beach, amenities include a sauna, jet spa, hospitality lounge, and onsite parking. On Kuhio Ave just a block and a half from Waikiki Beach, 2 blocks from the International Marketplace. 10 miles from the Honolulu Airport. Club Hiton Restaurant and Lounge.